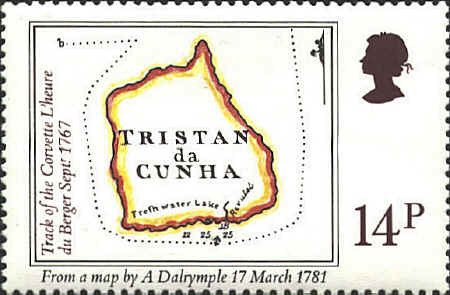 Tristan da Cunha was discovered in 1506 by the Portuguese navigator, Tristão d'Acunha:.The first survey of the group was made by the French figate L'heure du Berger in 1767. Soundings were taken and a rough survey of the coastline made. The presence of water at the large waterfall of Big Watron and in a lake on the north coast were noted, and the results of the survey were published by the first Hydrographer of the Royal Navy, Alexander Dalrymple in 1781. 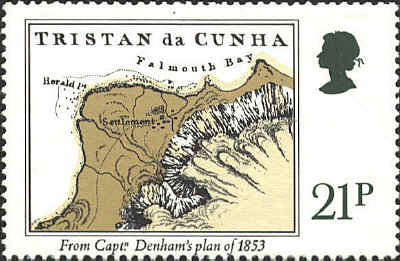 The map shows the track of L'heure du Berger based on a Chart of the Islands Tristan da Cunha by Le Sieur Donat, 1767. From 1852-61, Denham surveyed and charted the eastern seaboard of Australia. During his nine years of exploration in Australian waters, Denham undertook what is described as one of the longest and most important surveying cruises of the golden age of world hydrography. The Cocos (Keeling) Islands were name for Captain William Keeling who sighted the group of islands in 1609. Charles Darwin visited the atoll in 1836 on his way home from his three year journey on HMS Beagle. During his time on there he recorded evidence to support his theory of how coral atolls were formed. Darwin was aware of "the mountains of stone accumulated by the agency of various minute and tender animals." 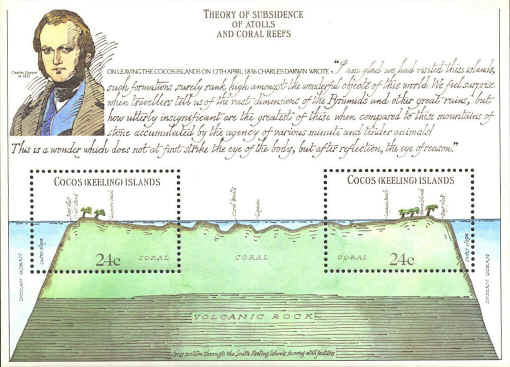 The map of a vertical section of the atoll shows the foundation of volcanic rock upon which the coral rest. The atoll raises to sea level where it resolves itself into islands surrounding a lagoon filled with coral knolls or reefs. He wrote, "This is a wonder which does not at first strike the eye of the body, but after reflection, the eye of reason." One of the most valuable 18th century maps of Bermuda is the 1740 version by the French cartographer Desbruslins. 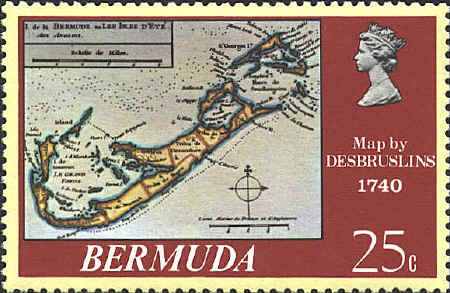 It shows Bermuda as the Isle de la Bermude, or Isles d'Ete' (Summer Island), with place names shown in French, such as l'isle Daniel, Irland, isle de Somerset, le grande Fonds (the Great Sound), isle de Tucker, les Freres Isle, Tribu de Warwick, Tribu de Pagets, Fonds d'Harrington (Harrington Sound), Havre de Southampton (Southampton Harbor, now Castle Harbor), Pointe du Chateau (Castle Point), etc.